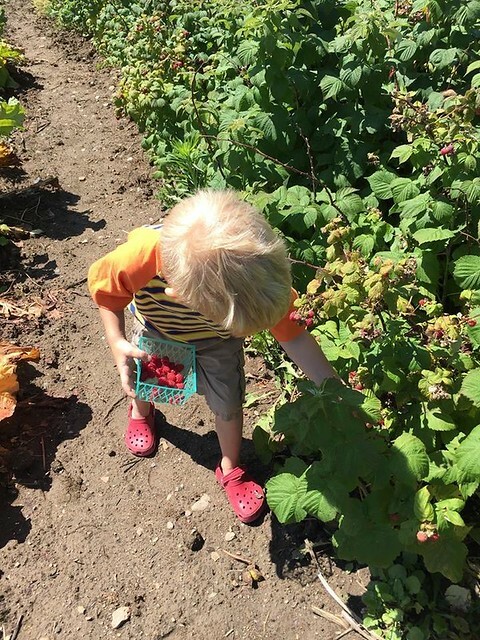 Berry season in Minnesota has seen a bumper crop this year. Everyone's raspberry bushes are busting at the seams — who was it that said they needed to pick their bushes morning and night — a neighbor, or someone? Someone I'd like to know where they live! How are your berries faring? 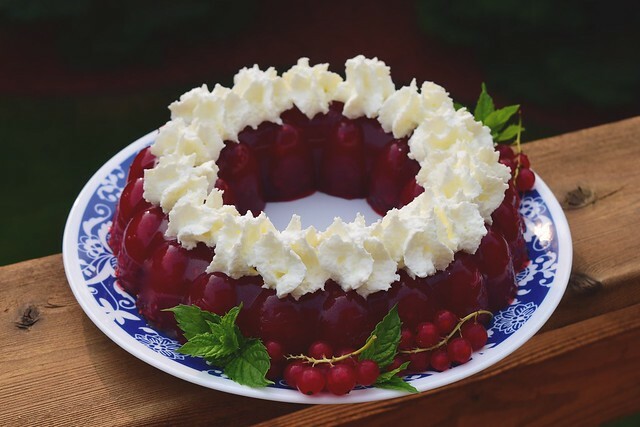 If you've got an abundance of berries or you've been given currants in your CSA I beg of you, try a 1970's Jell-O ring! No chemicals or nasty stuff here, though. Only berry goodness. The original recipe for this dessert is from Amy Theilen of the Food Network. A Midwestern Culinary Goddess who I stalk on Instagram. Her cookbook is full of gems I adapt according to what's in the pantry, like these Runza's which call for spinach, but the crisper was full of kale that day. 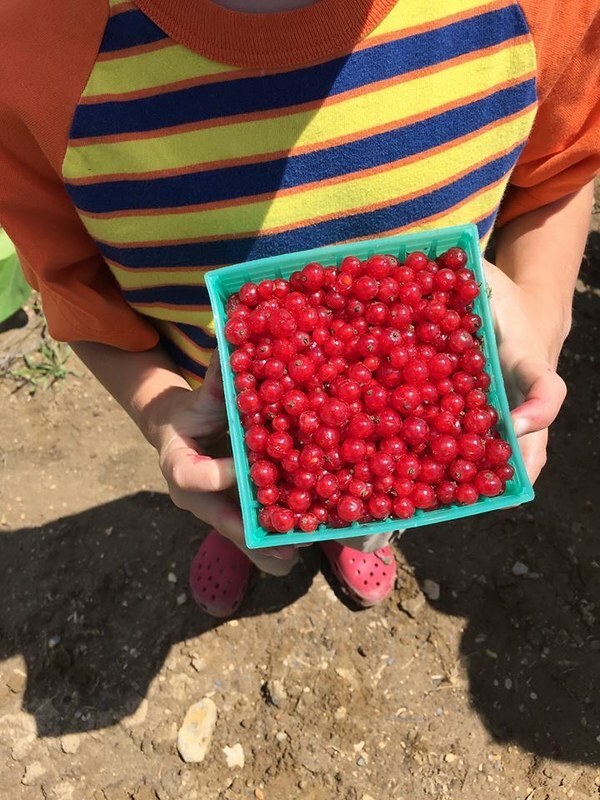 Liam was an astounding helper in the currant patch. 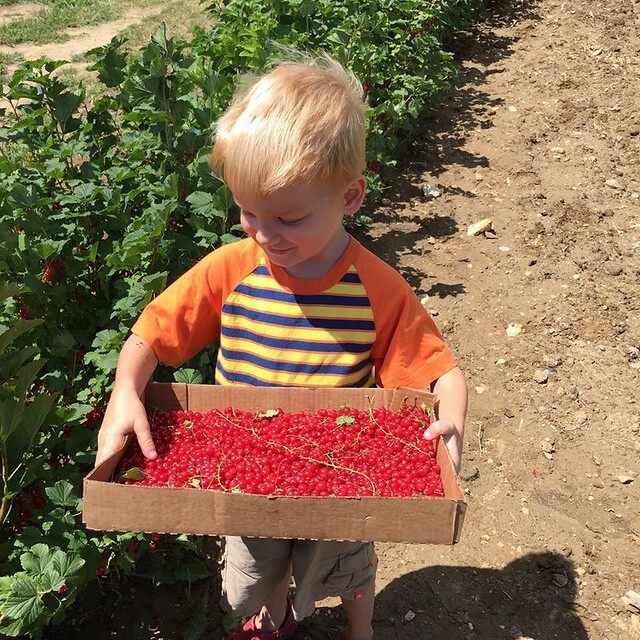 Have you ever picked currants before? Be prepared for a tedious job. Those little berries are so tiny and breakable, but Liam doesn't seem to mind by the look of his proud gee. Most recipes in my kitchen begin around what ingredients need to be used now — recently, it was the sliced limes from 4th of July sitting around fermenting in a plastic baggie waiting to be something greater and the tart currants from my CSA Box plus the abundant currants Liam picked in the field with Grandma. Time to get creative! How shall I convince my family to eat tart little berries? Jell-O! Making this dessert was foolproof. Assorted berries are boiled on the stovetop with sugar, the distinctively Swedish spice: cardamom, lemon or lime, and water. 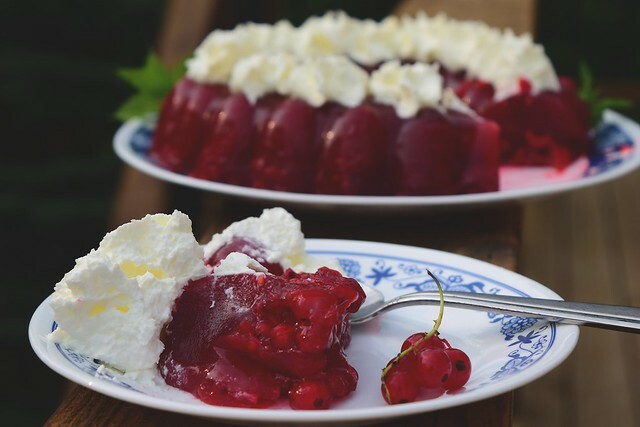 Gelatin is stirred into the warm berry juice which you then strain into a jewel-toned bowl of beauty then chill in either the refrigerator or freezer depending on your level of hurry-up-itty-ness, stirring occasionally until it thickens. You reserve some of the berries whole to stir into the chilling berry juice giving the end result some texture. Everything is poured into a Jell-O mold or Bundt pan to wait a couple hours. Dip the mold into hot water then invert and serve with lots of whipped cream. Want to make cute little puffs of whipped cream like I did? This is one of my favorite kitchen gadgets to quickly make whipped cream . 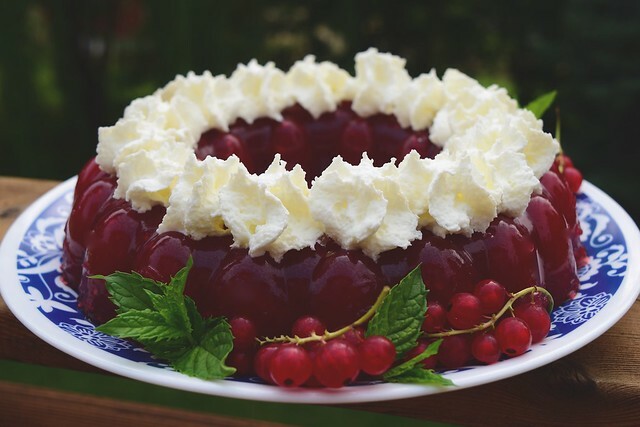 Cooking Note: If you would like a decidedly more tart gelatin, use lime juice and go heavy on the currants. Or if you prefer a sweeter dessert, go heavy on the strawberries and use lemon juice. Lightly grease a 6 cup Jell-O mold ring (this is the one I love) or bundt pan with olive oil . Set aside. In a measuring cup, whisk gelatin into 1/3 cup water, set aside. In a medium-sized saucepan, mash one pound of mixed berries with 3/4 cup sugar, stir in remaining 2 cups water, lemon or lime juice, and cardamom. Bring to a simmer over moderate heat and bubble for 5 minutes. Meanwhile, barely mash remaining half of berries with 1/4 cup sugar, leaving some whole. Set aside. 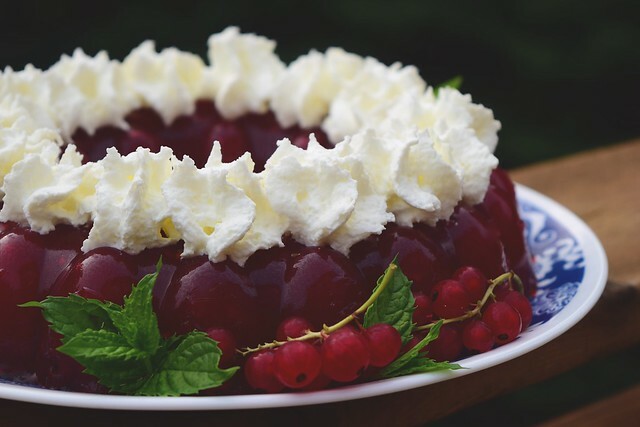 After berries have bubbled on the stovetop, remove saucepan from heat, stir in almond extract and gelatin until dissolved. Strain through a fine-mesh sieve into a medium-sized bowl, pushing on the solids to release all the juices. Refrigerate, (or put in freezer if impatient, like me) stirring occasionally until thickened slightly, about a half hour. Stir in the reserved berries and carefully pour into greased jello mold. Refrigerate for atleast 4 hours and up to overnight. To unmold dip the mold into hot water, gently run a knife around the edges and invert unto a platter. Slice in wedges and serve with whipped cream.